HAARP will hold its third open house under UAF management on August 25, 2018, from 9 a.m. to 3 p.m. There will be facility tours, science lectures and educational activities. The event is family friendly and free! If you prefer not to drive, you can buy round trip bus tickets departing from Fairbanks and Delta Junction here. Food and souvenirs will be available for purchase on site. More information to come here and on the UAFHAARP Facebook page. No weapons, pets or smoking are allowed on any University of Alaska Fairbanks facilities, including HAARP. 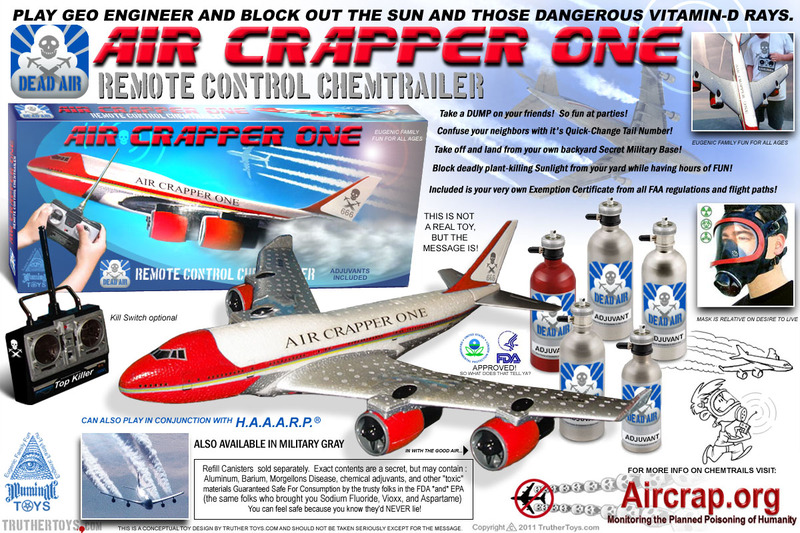 Air Crapper One – Remote Control Chemtrailer – Can Also Play in Conjunction with HAARP! crazy mad scientist world we live in, God protect us fighters of justice, Amen.